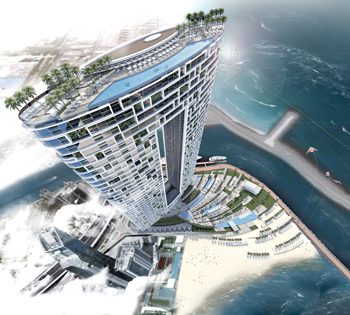 The building will be the tallest tower on Jumeirah Beach Walk skyline. Following the award of the main construction contract, Multiplex has started mobilising for work on the Address Residences Jumeirah Resort + Spa in Dubai. Multiplex Constructions, a leading international contractor, has been awarded the main construction contract for the Address Residences Jumeirah Resort + Spa, a mixed-use twin-tower development in Dubai. The iconic development with a built-up area of 257,000 sq m is strategically located on the last available plot on Jumeirah Beach Walk skyline. It will boast 217 rooms, ‘La Dolce Vita’-inspired furnished apartments, and The Residences Jumeirah Dubai, Managed by Address, which are unfurnished residential apartments. Multiplex has already started the mobilisation for the construction of the 77-storey tower development. The towers, being developed by Al Ain Properties, are set in an elegantly landscaped environment with direct beach access, and will also offer signature Address Spa facilities, high-end food and beverage outlets, retail and other lifestyle and entertainment amenities. The Address Residences Jumeirah ... a 77-storey development. 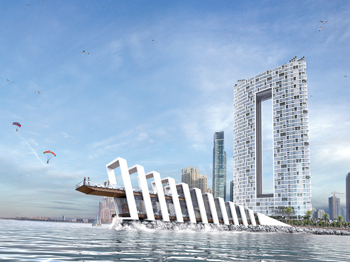 The project includes three basement levels, ground and podium levels, and 77 upper floors inclusive of the roof level. Mike Fraser, the managing director of Mirage Leisure and Development, says the appointment of Multiplex as the main contractor follows on from the recent completion of the shoring and piling works for the project. “We are confident that Multiplex will produce a high-quality product for Al Ain Properties, the owners of the project, and we look forward to the participation of client, contractor and consultant team to make this project a success, adding yet another iconic tower to the Dubai’ already impressive skyline,” he notes. Khedaim Al Darei, the managing director of Al Ain Properties, says: “We remain steadfast in our commitment to excellence. The appointment of Multiplex is a further testament to our continual strategy of delivering a world-class iconic development. Address Residences Jumeirah Resort + Spa’s unique value propositions include that it is the tallest tower on Jumeirah Beach Walk skyline, with prime views of the Arabian Gulf, The Palm Jumeirah, Dubai Marina and Ain Dubai (Dubai Eye), which is set to be the world’s largest observation wheel. The project is within walking distance of the Dubai Marina Walk, Jumeirah Beach Walk and The Beach Walk and it stands out for its shimmering façade and elegant architecture. Following the completion of enabling and piling works, the construction work started last month (October) with the development scheduled to be completed in the fourth quarter of 2020.